At Yazdani Dental, we do more than fix teeth. 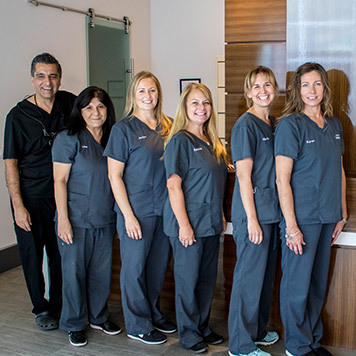 Dr. Milan Yazdani and our team members offer advanced care that’s tailored to each person’s unique needs and goals. We strive to form lasting connections with patients, and partner with each to achieve a lifetime of beautifully healthy smiles! Since 1994, we’ve served Aurora and surrounding communities. It’s an honour now to be caring for the children, and the grandchildren, of some of our first patients. We’re excited to meet you and your family and look forward to being your smile care partners! We believe dentistry is about caring for the person behind the smile. We work hard to get to know every patient, to learn and respect their desires, and always listen with open minds. We believe we are here to serve our community, not the other way around, with a holistic approach to dental treatment. Technology: In 2014, we built a new office, equipped with state-of-the-art dental technology, including digital X-rays, paperless charting, and intraoral cameras. The seamless integration of technology into the practice, along with the use of leading-edge techniques, are combined with our “patients needs first” approach to care. Connections: Here, you’ll never feel like an anonymous number on a chart. We’ll greet you by name, remember what’s important to you, and look forward to your visits as time spent with a friend. Communication: We want to understand what you are seeking and to know your concerns, too. We promise to listen without judgment and work with you to find the treatment approach that is right for your unique situation. Patient Education: We know that an educated, informed patient is best equipped to make healthy and responsible decisions about his or her oral and overall health. We provide a range of understandable, practical dental education, so you can develop healthier habits and a lifetime of great smiles! Professional Education: Our passion for education includes our own. We regularly seek out continuing dental education, to stay at the forefront of new techniques and technologies. Through careful evaluation of new options, we’re able to bring the best to you! Accessibility: Taking care of your family’s smiles, as well as your own, should be a stress-free experience. We are open alternating Saturdays and two evenings a week to accommodate your other commitments. Also, Dr. Yazdani will always come to the office, even after hours, in the event of a dental emergency. Today’s a great day to learn how Dr. Yazdani and our team can help you and your loved ones achieve bright, healthy, and beautiful smiles. Contact our Aurora, Ont. dental office, which serves Richmond Hill, Newmarket, and King Township, to schedule a consultation!